Posted 12 December 2010 in Bonus, Cooke Looks, Mister Miracle #1. But as for the content, the story doesn’t have the same energy and confidence as the other Fourth World debut issues, but in retrospect that makes the series even more remarkable because the title expanded and changed as it went along during its 18-issue run, the longest of Jack’s 4W books. And if we thought Scott Free was a slightly corny character to start, so deferential to old man Thaddeus and seemingly bland and unassuming (with very hip sideburns though! ), so apparently simple and average, we would become surprised how remarkably well-adjusted the young man ended up as we learned more about his hellacious background. Indeed it’s what the title grew to become which endears this particular issue to me. This is Dorothy back at the farm, so to speak, before the Scarecrow, Tin Man and the Cowardly Lion. Dorothy Gale before Oz and the Wizard; Scott Free before Apokolips and Darkseid. (Not literally, of course, but in the reader’s eye, if you know what I’m saying.) And those coincidences I mentioned raise tantalizing questions in me that delight rather than frustrate. Did Scott choose to be at the fence observing The Great Thaddeus at just that moment when Inter-Gang arrives (as Richard Bensam suggests in a reply on this blog)? Was Scott planning to assume Thaddeus Brown’s identity from the start, albeit likely not as the result of murder, of course! Is Scott in the country, walking on foot with carpetbag in hand — gawd, I love the idea of this super-scientific “eternal” carrying around an artifact from the 19th century, the much-maligned carpetbag! — to get distance from the city and hide from Darkseid’s agents looking to capture him and return to Apokolips? I know, I know, I’ve asked these questions earlier, but they’re fun to contemplate because the series did, indeed and in very short order, started weaving into a delightfully complex and rewarding tapestry, one that still leaves a whole bucket-full of questions. The biggest query of all being what did Jack ultimately intend for Scott Free? That is, the guy is a product of New Genesis, making him a “new god,” and he is one part of “The Pact,” his breaking of which started renewed war with Apokolips and spreading it to Earth… I mean, he’s a huge player and yet he seems like a (deceptively?) simple character, the most Earth-like of anyone from Highfather’s world. I’ll stop yammering except to say I’m pretty happy that I was underwhelmed with Mister Mister #1. 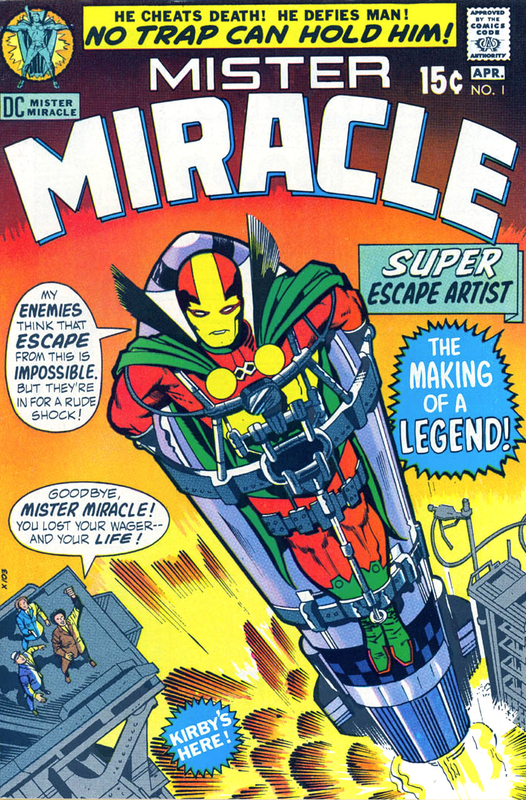 My little brother, Andy, picked this title at the time to be his Fourth World favorite (I liked The New Gods and Jimmy Olsen pretty much equally as my personal fave) and I understand why now: Mister Miracle is simply Jack’s purest super-hero created for the epic. He’s a conventional crime-fighter in some ways, yet refreshingly innovative, given the escape artist angle. He’s a nice guy, a friend to many, and he surrounds himself with people he cares for and who care for him. In other words, he’s a great role model and eminently pleasant character, almost totally out of tune with that era of the emerging anti-hero and yet perfect for that time with his hippy-like attitudes… Jack, you did it again!